Kelly Dodd To Vicki Gunvalson: "I Made Better Choice In My Life Than You. I'm Sorry If You're Jealous." Vicki tweeted and deleted a link to an article called “Bravo Standing By Vicki Gunvalson! Network Is Also Working Overtime To Bring Kelly Dodd Back After Drug Accusations.” It’s not surprising that she posted a favorable article about herself. The shocking part is the extra commentary that she tacked on at the end. Vicki wrote, “Of course she now is changing her mind. She has NO job or career.” Someone sent Kelly Kelly nabbed the screenshot and went OFF on the OG of the OC. I have no idea what they’re even fighting about. To be honest, I don’t even think that they have can identify the true root of their issues. I’m just sitting here thinking selfish thoughts about Season 14. Just imagine this social media exchange in person during a cast dinner party. This is the kind of drama that we need. TELL US- WHAT DO YOU THINK ABOUT VICKI GUNVALSON’S TWEET? 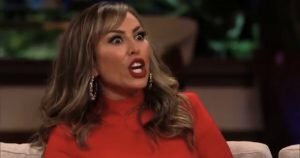 WHAT DO YOU THINK ABOUT THE RESPONSE FROM KELLY DODD?